Oli Epp (1994) is young, passionate, and on his way up. The half Canadian, half British painter is based in London, where he recently graduated from the City & Guilds of London Art School. He already started gaining recognition while at art school through his posts on Instagram. In 2016, he was featured in a GQ article entitled Early blue chip artists to invest in. According to Epp, this was all due to Instagram, since his website wasn’t even up back then. And the day he graduated from art school, he announced on Instagram that all of his works had been sold, through the hashtag #sold-out. Amidst the madness of the art world jungle, Epp has even already managed to coin a term to describe his work: post-digital pop. Epp’s paintings interweave topics such as consumerism, digital imagery, and everyday life with a nice sharp dose of humour. His paintings often reveal universally recognisable corporate symbols and brands of mass-produced goods and food (Mc Donald’s, Coca Cola). 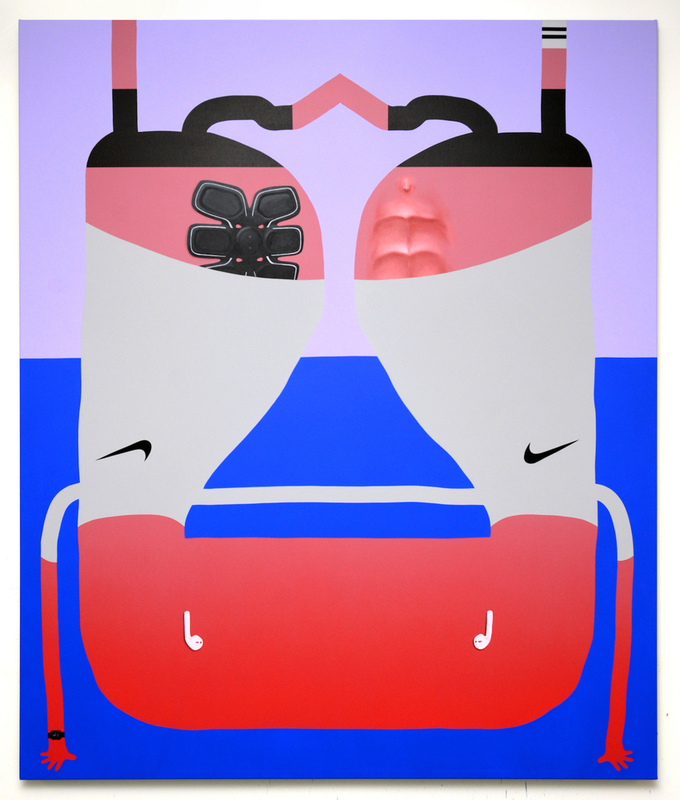 Epp is inspired by pop art, infusing his works with images from our contemporary consumer landscape and addressing our materialistic society with a sharp, critical sense of humour. 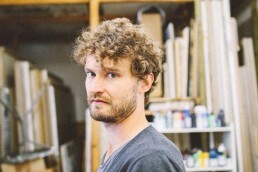 ‘I laugh when I paint,’ said Epp in a 2017 Art Verge interview. His paintings are informed by everyday events, and he always looks out for peculiar situations that people usually pass by without appreciating. Bringing out the ridiculous and absurd in everyday occurrences in our consumer landscape is Epp’s forte. He often paints avatars, amorphous creatures with oversized heads without facial features – a reflection on human interaction in the post digital age. In this spirit, he takes a lot of inspiration from videos people post on social media. In his words, people collectively record their contemporary rituals and behaviours there. 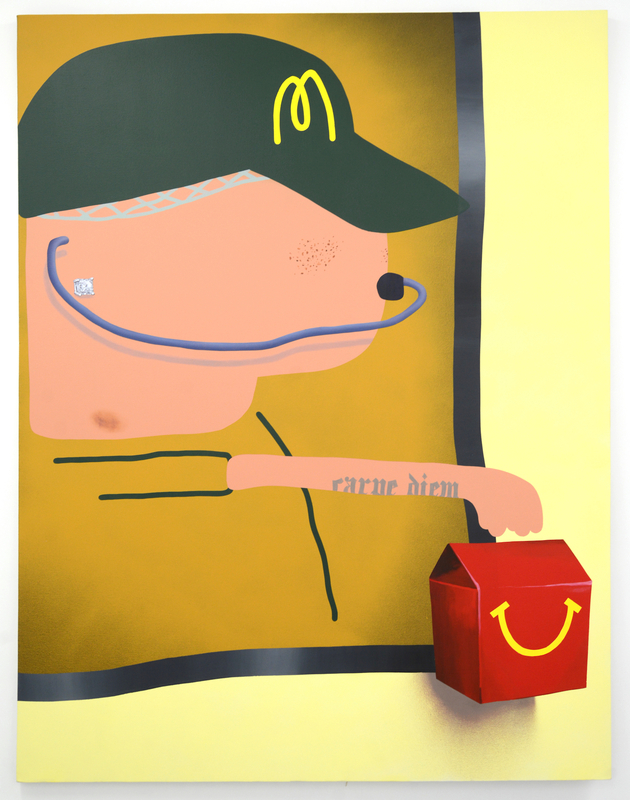 In his 2017 painting ‘Carpe Diem’, Epp portrays one such amorphous figure in a McDonald’s cap, holding out an order from his take-out window. This was a response to the 24-hour McDonald’s drive thru next to Epp’s apartment. The figure has ‘Carpe Diem’ tattooed in gothic letters on his arm, revealing Epp’s knack for social satire. 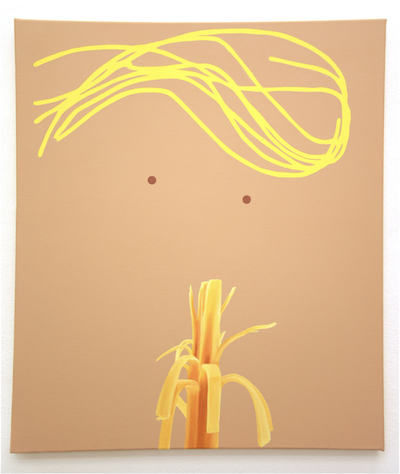 One of the pieces that Epp gained online notoriety for is ‘Trump Eating a Cheesestring’, which he did in 2016, the year Trump was elected president. The minimalist painting consists of a few yellow stripes for Trump’s hair, two dots for eyes, and a classic American cheesestring. The simplicity of the piece makes it an all the more effective work of critical commentary. There is something of H.G. Wells’s novel The Time Machine in the characters of Epp’s paintings – the tragic creatures that have become so dependent on technology that they numbly wander around their world, which is falling apart around them because they no longer know how to take care of it. 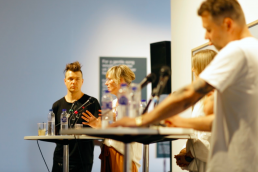 Between his time in the studio and preparing for exhibitions, the young artist also set up a Summer Studio Residency in London for 6 selected artists to work in London over the summer 2018. 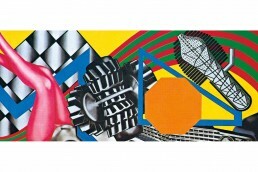 He’s funding the project through the sales of his screen prints from his Paris show. And in March 2019, Epp will have his first US solo show in LA, at the Richard Heller Gallery. 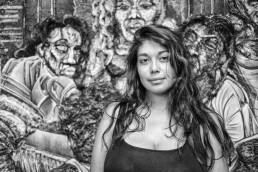 Keep your eyes on this rising star! 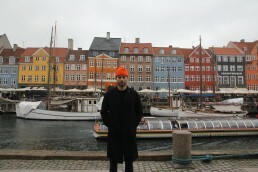 More information about Oli Epp here.